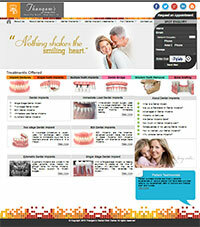 Dentures are removable prosthetic appliances. They can replace all or part of the teeth in an arch. 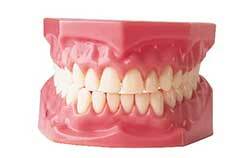 If all the teeth in an arch are replaced it is called a complete denture. If only some of the teeth are replaced it is called a partial denture. An upper full denture is retained by a suction effect. It rests on the tissues of the roof of the mouth and is an excellent, low cost restorative alternative if all the teeth are compromised and cannot be saved. The firmness of the supporting soft tissues greatly determines the stability of the denture. A proper, balanced bite during chewing is also important. Lower full dentures do not have the suction retention of an upper and require precise fit and a balanced bite for proper stability. A partial denture is retained by some or all of the remaining teeth through a variety of clasps or clips. Stability comes mostly from the teeth. Fixed prosthodontics includes replacing missing and/or broken teeth and tissue with restorations that the patient cannot take in and out, such as veneers, crowns, bridges, and implants.